AC Milan will be looking to improve on their sixth-place finish in Serie A last season, and they continue to be linked with reinforcements this summer to help them do so. 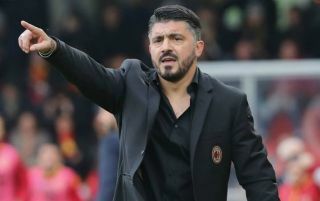 Gennaro Gattuso took charge in November and oversaw an improvement, but the limitations in the squad were obvious as the campaign went on as there was a real lack of quality depth in key positions. That is reflected in the fact that Suso made 50 appearances in all competitions last season, and so a player capable of offering competition and cover on the right wing should be a priority for the Rossoneri this summer. As per Goal.com, Milan have already secured the signing of Pepe Reina on a free transfer, while beIN Sports note that Ivan Strinic has revealed that he will sign with the club too. Now, according to Calciomercato, the Italian giants could be closing in on their third signing of the summer as it’s claimed that a deal could be reached to land former Barcelona starlet Alen Halilovic on a free as soon as Monday. As noted in the report, the 22-year-old underwent his medical this week, as he could be handed a major opportunity of redemption after failing to impress at the Nou Camp. He has since featured for Sporting Gijon, Hamburg and Las Palmas, and although he hasn’t particularly set the world alight with a handful of goals in that time, he’s seemingly done enough to impress Milan to swoop for him to add another attacking option to their squad for next season. Meanwhile, scoring goals was a real problem for Gattuso’s men last season, as they managed just 56 in 38 league games which was the worst tally of the top seven sides. In contrast, Ciro Immobile had no problem finding the back of the net as the 28-year-old bagged 41 goals in 47 appearances in all competitions for Lazio. According to MilanNews.it, via the paper edition of Tuttosport, he’s been linked with a move to the San Siro, but Lazio are reportedly set to demand a whopping €80m which could fend off their rivals from prising the Italian international away from the capital.